the fruit from Tahiti to the West Indies. History: Native to the Pacific and EastIndies. Shape: Round to egg-shaped fruit. 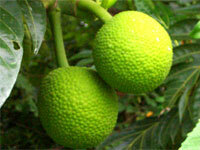 Colour: Breadfruit has a thick, warty, greenish skin and white starchy flesh with a bread-like texture. Taste: Sweet when eaten ripe. with eucalyptus oil. Breadfruit seeds are used in a similar way to jakfruit seeds. If breadfruit is allowed to ripen, the flesh becomes light yellow, very soft and very sweet. Ripe breadfruit is also used for dessert dishes. Stage of ripeness is critical to any recipe using breadfruit.